With our love spell kit, you can easily attract a lover or save a broken relationship. We can also customize a spell kit depending on your needs. 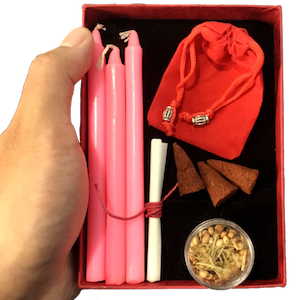 With our love-drawing ritual kit, you can easily attract a man/woman of your desire or save a broken relationship. Each kit contains all the materials you need and detailed written instructions. Salamat po tata Adlaw sa ritual kit..
Can I use this to help somebody I know get together with someone else? Pwede mong bilhin para sa kaniya pero siya dapat ang gagawa ng ritual. Can I use this sa taong malayo na gusto kong magustuhan ako?